Where is Ollie Harrington When You Need Him? The last Valentine Day marked the 105th anniversary of the birth of Ollie W. Harrington. More than half a century before Aaron McGruder’s first introduced The Boondocks as a comic strip and decades before the biting social commentary found in Garry Trudeau’s Doonesbury and Berke Breathed’s Bloom County (whose "Oliver Wendell Jones" may have been a nod to Harrington), cartoonist and essayist Oliver W. Harrington set a standard for Black readers throughout the 20th century, combining his signature wit with incisive critiques and observations about Black life in America. With the teacher, Miss McCoy, as his racist muse, Harrington began documenting the everyday pitfalls of his life via cartoons that he kept in his notebook. Harrington also recalls a police officer named Dougan, who “had a bad habit and that was going on a spree every Saturday night and beating the hell out of every Black kid he could find…that was life in the Bronx.” With little recourse, Harrington turned to art and never looked back. Upon graduating from DeWitt Clinton high school at age 17 in 1929, Harrington left home and set up residence at the famed Harlem YMCA. Though the financial crisis of 1929 would dampen the excitement that had been brewing in Harlem since the first cadre of Black New Yorkers migrated from lower Manhattan, uptown to Harlem at the beginning of the 20th century, the still teen-age Harrington was able to connect with Harlem Renaissance stalwarts like Wallace Thurman, Rudolph Fisher and of course Langston Hughes, who took the young cartoonist under his wing. Among the residents at the Harlem YMCA, where Harrington rented a room for $2 a week, was Dr. Charles Drew, who would later revolutionize blood plasma research before his untimely death in 1958. Harrington’s first published pieces in 1932 appeared in Black magazines like the New York State Contender and The National News, which were edited by noted Black satirist (and influential conservative thinker) George S. Schuyler. A year later Harrington, began his long term relationship with The Pittsburgh Courier, which along with The Chicago Defender and New York Amsterdam News (which also published Harrington’s work) were the premiere Black newspapers in the country. Harrington’s relationship with the Black Press—a conscious choice when there weren’t legitimate alternatives—highlights the critical role that the Black press has played historically in developing the skills of Black journalists, sales professionals, designers and publicists. Though Harrington could never have hoped to have a cartoon placed in the New York Times, the Black Press offered both the kinds of audiences he desired as well as the opportunity to sharpen his skills. Harrington’s strip “Boop” (later renamed “Scoop”) began appearing in the Pittsburgh Courier in 1933 and like his earliest work found its inspiration in the lives of Black children, including the classroom dynamics that Harrington was himself politicized by. Well before the broader society found any significance in what we now refer to as “youth culture,” Harrington used Black children to offer commentary on the realities of everyday life. It should be noted that “Scoop” debuts nearly twenty years before Charles M. Schultz’s Peanuts strip—which McGruder has cited as an inspiration for him—and though there’s no evidence that Schultz was at all familiar with Harrington’s work, Schultz became friends after World War II with Morrie Turner who was the first African-American nationally syndicated cartoonist with his strip Wee Pals. We can only wonder what the trajectory of Harrington’s career might have been if he had access to national syndication like Schultz experienced. Ultimately Harrington would find his most influential “voice” in 1935 when his “Dark Laughter” series first ran in The Amsterdam News. It was in the ‘Dark Voices” strip that Harrington first introduced the character of Bootsie, a Harlem everyman, who as scholar M. Thomas Inge, suggest in his book Dark Laughter: The Satiric Art of Oliver W. Harrington, attempts to “reconcile the contradictions and absurdities of their daily lives, especially the incongruity between the American Dream and the nation’s failure to fulfill it.” As Harrington recalls, he was “more surprised than anyone when Brother Bootsie became a Harlem household celebrity,” noting in the essay “How Bootsie was Born,” that “to really dig Brother Bootsie, his trials and tribulations, you’d have to see Harlem from the sidewalk.” Every bit as popular as Langston Hughes’s “Jesse B. Semple,” Hughes would later write the introduction to Harrington’s 1958 collection Bootsie and Others: A Selection of Cartoons. Always creatively and professionally restless, Harrington moved to Adam Clayton Powell, Jr.’s fledgling The People’s Voice in 1942, becoming the newspaper’s art director. One of Harrington’s first projects at The People’s Voice, was a serialization of Richard Wright’s Native Son, which had been published two years earlier. Given the politics of respectability that had dogged even the careers of Black literary celebrities like Hughes, the serialization was pulled because of reader complaints about the profanity that was presented. Some of the criticism of the Native Son strip also took aim at Harrington, who in another strip commented on the popularity of the Zoot Suits (the hip-hop style of the 1940s), leading readers to complain about his focus on “pimps” and other characters that were thought to demean Black folks. This is also a critique that has been aimed at many Black comedic artists who embrace satire, but in Harrington’s era it also represents his unwillingness to only use his art for simple “uplift” purposes. As World War II began to rage, Harrington was hired by the Pittsburgh Courier to provide illustrated stories about the experiences of Black soldiers, including the 332nd Fighter Group—the famed Tuskegee Airman—and to create an original strip, “Jive Gray,” which also documented the black experience in the war. As part of his responsibilities with the paper, Harrington also served as the paper’s war correspondent in North Africa and Europe, allowing him the opportunity to develop a more cosmopolitan worldview. The experiences covering the war further politicized Harrington. After a spirited debate with US Attorney General Tom Clark in 1946 about several unsolved lynchings of Black men in Georgia, Clark, in response to Harrington’s public militancy, labeled him a communist. Given Harrington’s role as head of public relations at the NAACP (which in the late 1940s was still staffed by legitimate political radicals), he was an easy target for the stream of anti-communist sentiment that took over the county in the form of McCarthyism. After Wright’s death, Harrington only returned to the United States on two occasions, first in 1972 and in 1991, when his worked as being exhibited at Wayne State University in Detroit. From aboard Harrington continued to publish his “Bootsie” strips for the Chicago Defender and after that relationship ended, he published regularly for a newspaper in East Germany, where he lived until his death in 1995 at age 83. Harrington’s collection of essays Why I Left America was published in 2010. Sadly, Oliver Wendell Harrington remains a footnote to African American politics and popular culture, though his willingness to sacrifice his career and comfort in the name of using his art to directly address the racist nature of American society create opportunities for others. In February of 2008, eight African-American cartoonists staged a “sit-in”—each publishing a common themed strip—to bring attention to the few slots available to Black cartoonists. The artists chose February 10th as the date of the protest because of its proximity to February 14th, which would have been the 96th birthday of Ollie Harrington. Indeed one of the protesters Keith Knight, who has found success as a Black cartoonist in the digital era, cites Harrington as an inspiration for his own strips (Th)ink, The Knight Life and The K Chronicles. 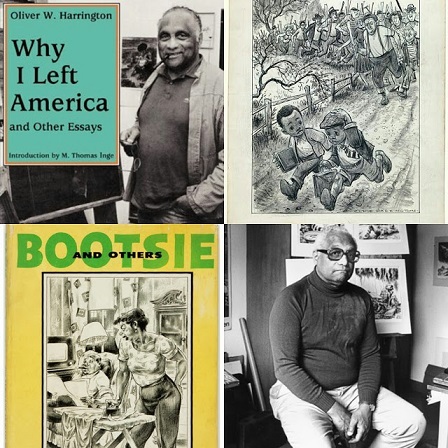 We can only imagine what Ollie Harrington would have had to say about the nation’s first Black President or the man who followed Barack Obama into the Presidency, though I suspect Harrington would have drawn lines as he always had – in the name of those who were voiceless, invisible and Black. Mark Anthony Neal is a professor of Africana Studies at Duke University. He has been conjuring analog for a digital world for a quite a while now. Check him at @NewBlackMan + @LeftofBlack + BookerBBBrown on the ‘Gram + and the homebase at NewBlackMan (in Exile).